Just West of Frisco, Colorado (elevation 9,000 feet) on I-70 in Summit County Colorado begins a mountain range called the Ten Mile Range. With a northern terminus overlooking Officers Gulch this range extends south picking up the Continental Divide just past Breckenridge. My goal for this hike was Peak 1 - on the north end of this range. Begin your hike at the parking area on the south side of I-70 at the west Frisco exit. Here you will find a parking lot which is used mainly by bicyclists gaining access to the bike path which runs from Breckenridge to Copper Mountain (via Frisco). Since the trailhead for our hike is along the bike path you should park here as well. From the parking lot, cross the bridge and turn left on the path (towards Breckenridge). You will follow the bike path for about 400 yards (?) or ten minutes or so. This is where you will see on your right a sign for the ghost town of Masonville and another sign for Mount Royal. When you see these signs you will know you are in the right spot to begin your hike. Follow the trail as it climbs up the mountain through the forest. Although there are a couple of switch backs on this trail, most hikers will find it steep. After about 30 minutes of serious hiking you will begin to come across the remains of the town of Masonville. [The founders of Masonville apparently weren't too mountain savvy as most of the town was built in an avalanche path] Continue up this trail as it maintains a steep climb to where I reached Mount Royal - 45 minutes after leaving the trailhead (chances are it will take you a little longer to get there). Mount Royal isn't really a peak but is more of an overlook of Officers Gulch and the highway (I-70) below (to the north). This is the destination for most of your tourist hikers as they are pleased with their accomplishment of reaching this point. The main trail to the next summit along this journey (Victoria Peak) actually diverges from the trail to Mount Royal about 200 yards before you reach the overlook however not wanting to backtrack I chose to climb the ridge directly from Mount Royal hoping to find the trail somewhere above me. This was no problem as the area had been heavily traveled and in a matter of minutes I once again found myself on the trail. The trail was still steep as it climbed through the forest while approaching treeline. For me it was about another 20 minutes from Mount Royal until I reached the radio structure (no trespassing) on top of Victoria Peak. From here the views really began to open up to the south and east and I could see many familiar mountains (which will be described later in this trip report). Again, Victoria Peak isn't so much a peak as it is a sub-peak of Peak 1. Translation: This is where the climb really begins! The ridge to the top. At the top of the last slope, you will find yourself climbing along a ridge that has become quite rocky with drop-offs on either side - about 3000 feet down to the right (north) is Officers Gulch and to the left is a bowl bottoming out about 1000 feet below. After a short scramble through these rocks, I faced a decision. Continue along the rocks (they appeared to be getting steeper) or traverse the gully just below the snow field to gain access to another ridge which appeared to have less pitch and better footing. I chose the latter. Caution: This traverse across this gully was very exposed and none of the rock in the area was stable. Although the total distance across was only about 75 feet, I was (almost) scared until I got to the other side. The last pitch to the summit. Once I had crossed this gully I had another steep climb on dry ground right next to the edge of the snow. After about 75 feet of vertical, my path turned slightly left towards the summit providing me with plenty of stable boulders for rock-hopping my way to the top of Peak 1! Total time up - 2 1/2 hours (half the time they said it would take back down at Starbucks in Frisco). Elevation - 12,805 feet. On the top there is a new but broken weather station on which the elements apparently had taken their toll. Other than that, there really isn't much room on top but the views were incredible! Spying the next peak (Tenmile Peak) in the range just to the southwest (I can get there - really! ), and with no threat of bad weather stopping me on this day, I decided to press on. To get there I would have to follow a ridge that was a little too narrow to be called a saddle. For the length of this ridge the drop-off to my right (west) went all of the way down to I-70 and Officers Gulch and on my left was the same drop-off into the bowl briefly described earlier. No where along this ridge would I say it was particularly safe and I had to hug the rocks while traversing just below the ridge - mostly on the bowl side. 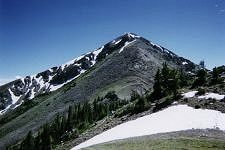 After about 45 minutes on the ridge I arrived at the summit of Tenmile Peak (elevation 12,933 feet). Although this summit wasn't much larger than Peak 1, I decided to enjoy the solitude it provided me and I stayed on top for about 20 minutes. My trip back to the summit of Peak 1 retraced my route across the narrow saddle. Other than seeing a Ptarmigan with 4 baby Ptarmigan chicks, this section of the hike was uneventful. 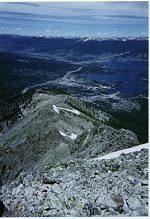 Looking down on Frisco and Dillion Reservoir. Back on the summit of Peak 1, I decided to descend via the rocks instead of my original ascent route (on the East side of the gully and snow field). I knew what it was like where I came up but I didn't know what it would be like going down through the rocks. While there was plenty of sturdy rock I could hold onto with my hands but the footing was primarily loose dirt. This made traction almost non-existent and therefore this route down seemed more dangerous than my previous route across the gully and around the snow field. Once I had navigated this rather tough section of the hike I was able to catch my breath and enjoy my trip back down the steep slopes. When I had come down to a hump just above Victoria Peak I could see several hikers below me sitting on the trail taking a break. Another hiker approached me on his way up and warned me about a rambunctious Mountain Goat that was in the area. After descending another hundred feet or so I spotted the goat running perpendicular to my own path about 200 feet in front of me. I caught the goats attention and he stopped dead in his tracks. He turned and looked at me and although I have encountered goats many times before in the back-country, this one made me a little nervous. He was a little too animated for my liking. 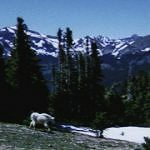 As he was near the trail, I proceeded slowly and when I was within about 70 feet of the goat, I snapped a photo and quietly continued on my way while looking over my shoulder to keep an eye on the goat. When I reached the hikers that had been resting on the trail, they told me that the goat had chased them and at one time he was as close as 40 feet from them. This couple was from Nebraska and they had concluded that either the goat was sick (it looked pretty healthy to me) or that it was guarding a kid (baby goat?). My own hypothesis was that this was a male defending his turf (his hump beard told me it was a male). After a brief chat with this couple, I continued ahead of them following what I thought was the trail. As the trail went into the trees, it also disappeared. Oops - there it is. Again I followed the trail and once again it disappeared. Must be a game trail I thought. As I am no stranger to bush-whacking I continued through the trees down the slope - I didn't know if the couple from Nebraska was still following me or not. After loosing a lot of elevation, something didn't seem right. I was able to find a partial clearing and spotted my goal (Mount Royal) about a quarter of a mile to the east. I was on the wrong ridge and heading straight down into Officers Gulch. My solution was a grand traverse across the mountain (further back to the east). One key to this traverse was that I didn't want to lose any more elevation until I had found the trail. This is because there is nothing worse that having to climb up on your way back down. After about 15 minutes of traversing I came across the trail and confirmed the fact that I had been mislocated (not lost - never lost). The trail took me back down to my cutoff to Mount Royal where I took one more look into the canyon before continuing my trip the rest of the way back down the mountain to the bike path and finally my car.